Assumed to be in use by Artus & then Anne, prior to 1913. 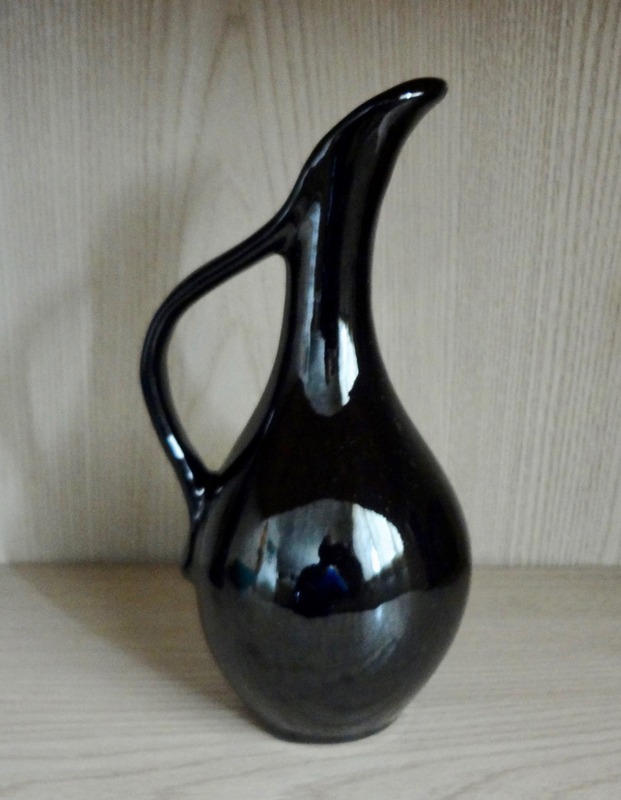 Artus developed and created pieces in several shades of black. 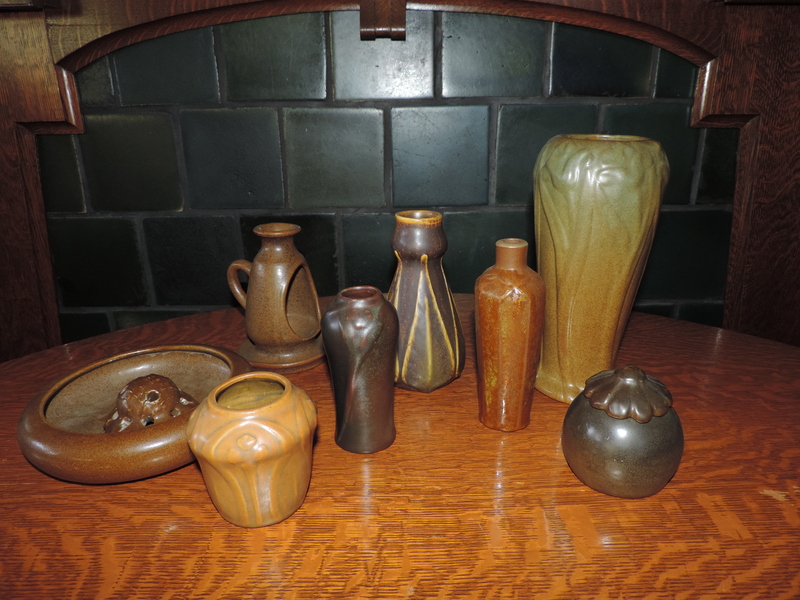 The center piece is marked as an experimental in Black & Brown Glaze, and dated 1902. 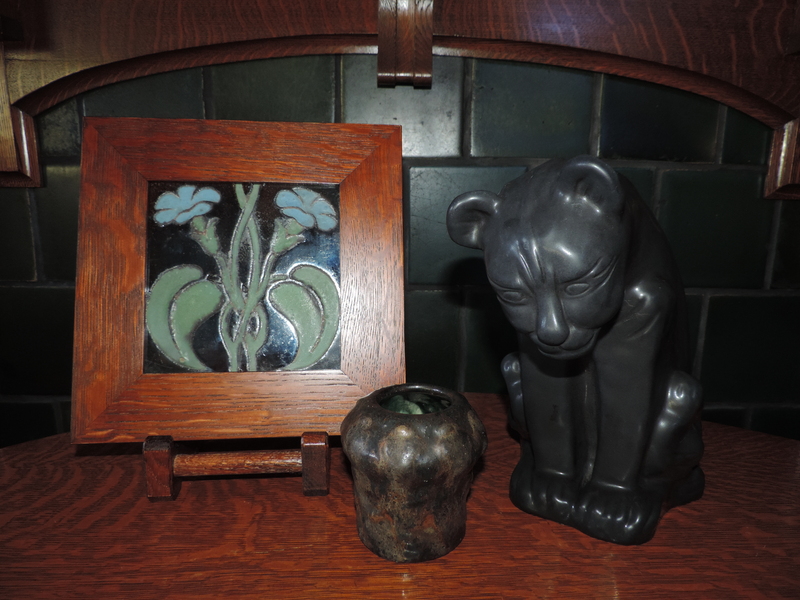 The tile on the left is a vintage, probably pre-1910 tile with high-glaze Black. The high-glaze black is also used on tile covering the spaces between windows on the roof of the 1908 Memorial Pottery, south side of the building. 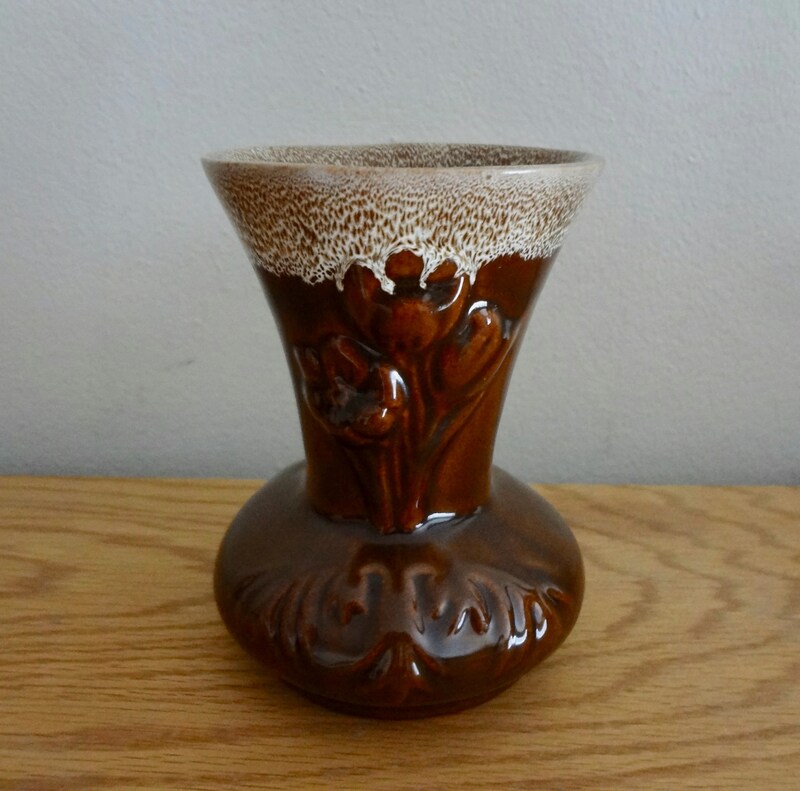 The Matte Black Chimney Cat is from the mid-century period, when J. Emma Kinkead created a stylized cat version of the original 1908 Chimney Cat. 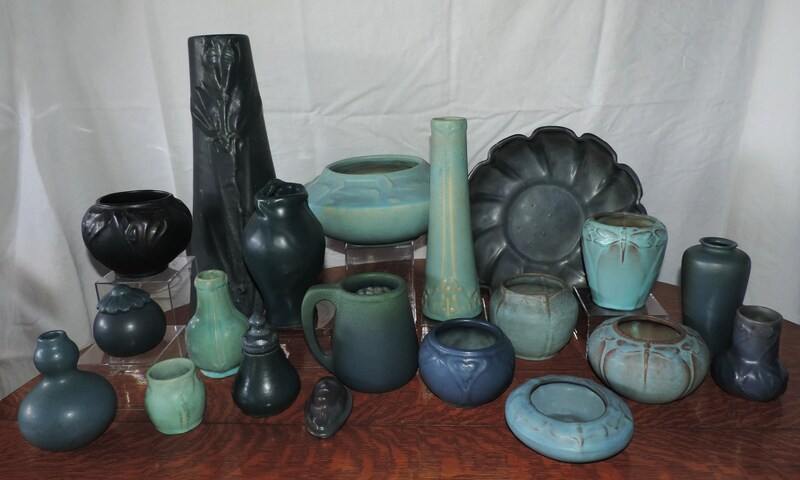 There were numerous shades of blue glazes used on pottery throughout the years. 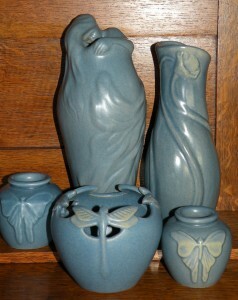 Artus created several shades of blues, greens, pinks, etc. during the very first years. 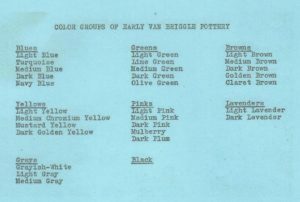 While blues and greens were probably the most predominant; Artus also created designs in white, black, several shades of brown, mustard yellow and other shades of yellow, etc. Artus also used multiple color glazes in layering colors, or with a 2nd or 3rd as a highlight of the design in an over spray technique. These are just some of the blue glaze examples. 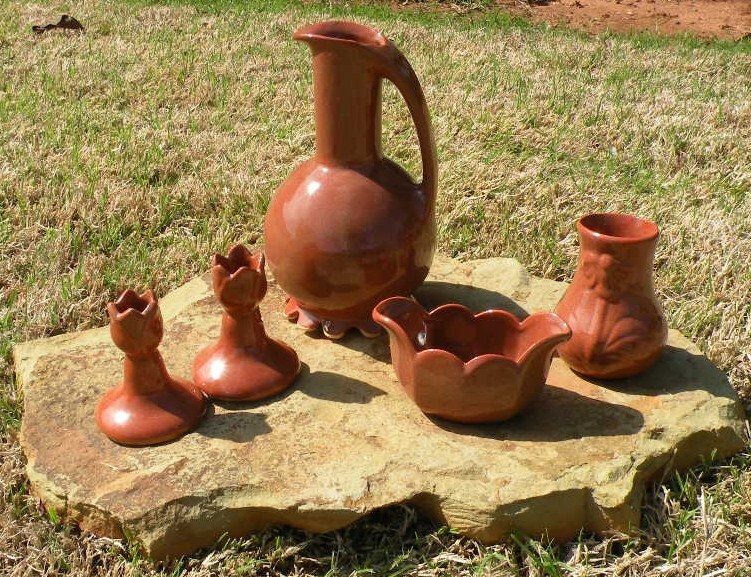 There were many shades of brown used in the early pottery designs. The bowl on far left has been affectionately called the color of “tobacco spit!” The #310, in front, I refer to as almost butterscotch. The #833 or #836 in the middle is very dark brown, with flower of 6 petals. The middle piece has touches of yellow, as does the #376 “Stars & Stripes” design, which has some matte glaze and some high glaze on the same vase. The tall #503 is brown with green over spray – but not the brown & green of Mountain Crag Brown Glaze, shown below. The pieces are all dated from 1905 to ’20 for 1920; except for the far right #879 Potpourri, which is thought to be from the teens. If you have not seen the Gold Ore Glaze pieces by Van Briggle Pottery; they are somewhat difficult to find. Produced in 1956 for only a few months, the pieces are limited in numbers. They do occasionally pop up at antique shows and sales, but are more often than not unidentified. The clay color showing on the bottom is a beige-color similar to other pieces known as “Anna Van” produced by Van Briggle with a tan, smooth clay during the 1955-1968 period. 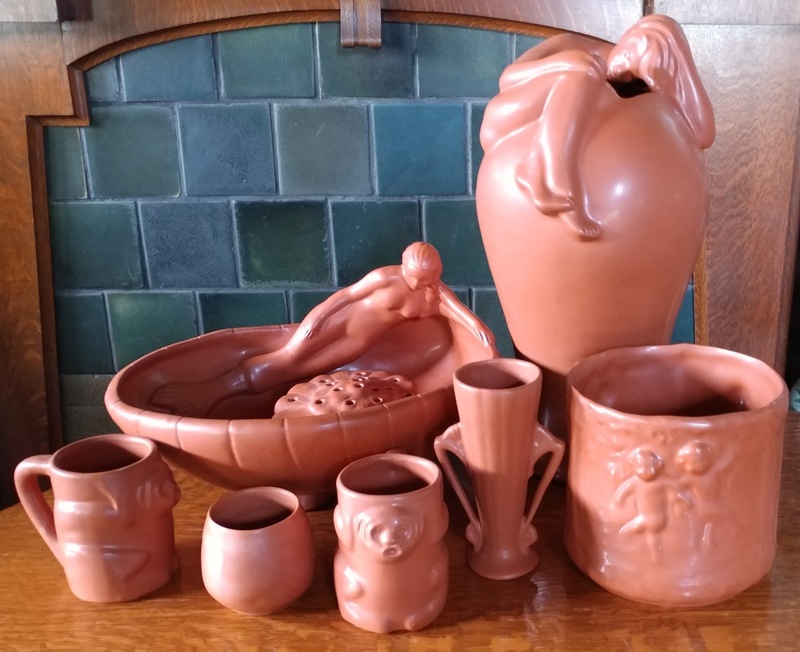 A Colorado Springs Gazette Telegraph article states “SOMETHING NEW…Visitors to the Van Briggle Pottery have long been interested in such things as ‘throwing on the potter’s wheel’ and the huge kilns in which pieces are baked, but this year they’ll see something new – the dipping of pottery pieces into a solution containing gold. After being dipped the pieces are glazed.” The article continues by saying that powdered gold ore from Cripple Creek Gold Mines is incorporated to give the final product a speckled effect. 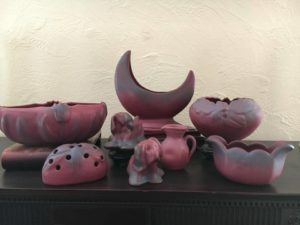 Several different Van Briggle designs have surfaced, and most bring high prices through online auction, due to the novelty of the glaze. One report of a Gold Ore Despondency has been documented; however, most of the pieces are of small to medium size. In today’s market – obtaining a Van Briggle Gold Ore Glaze just might be the easiest way to own your piece of gold! 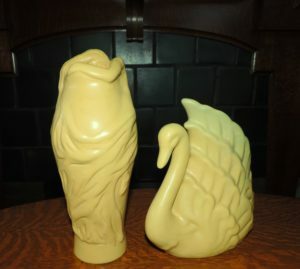 Goldenrod glaze was produced by VBPCo from the late 1970s to the early 1980s. 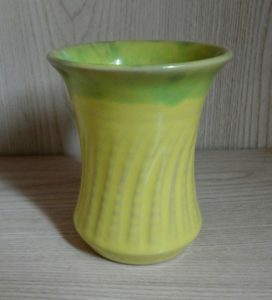 It was a very strong, bright yellow; and most nearly resembled the early Mustard Glaze by Artus Van Briggle. The glaze was used alone, as on the Lorelei; and sometimes with a blue over spray, as on the tail of the swan. 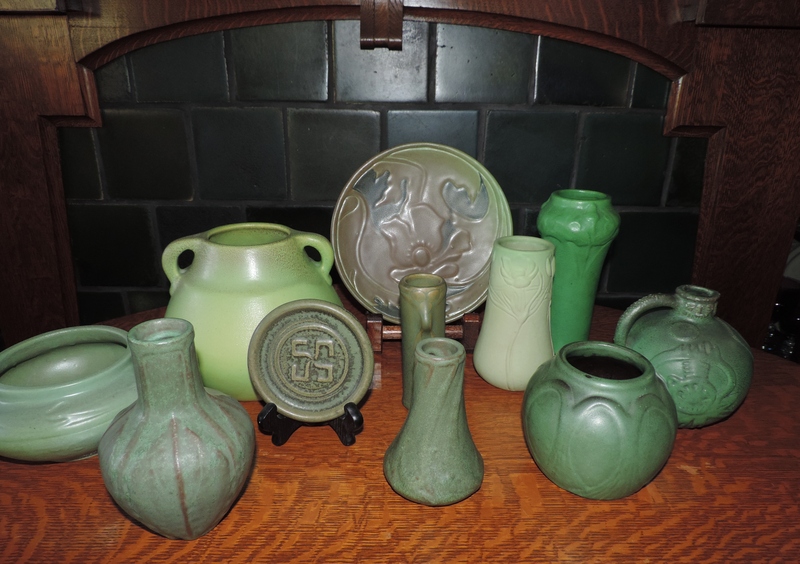 Artus listed at least 8 shades of green glazes that he developed and used on his pottery prior to his death in 1904. The photo shows only some of the variety: 1903, 2-handled pot has Granny Smith Apple Green with Red over spray; 1903, 8″ plate has 3 colors of glaze including green. Color contrast the lightest green floral #85 to the BRIGHT green behind it on the right side. 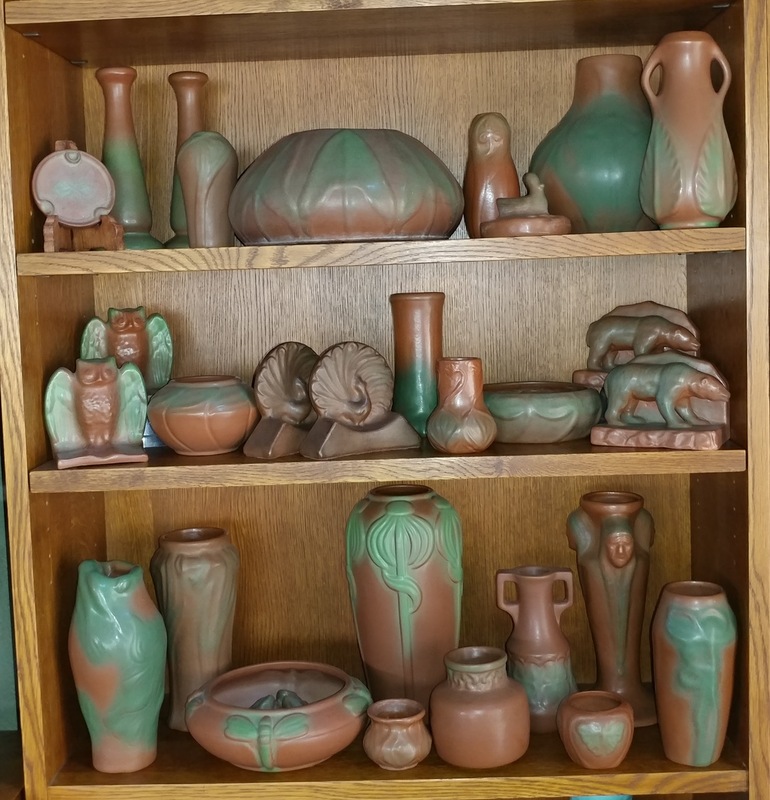 The front, left piece is green over the chocolate clay used most often in 1906 and 1907. 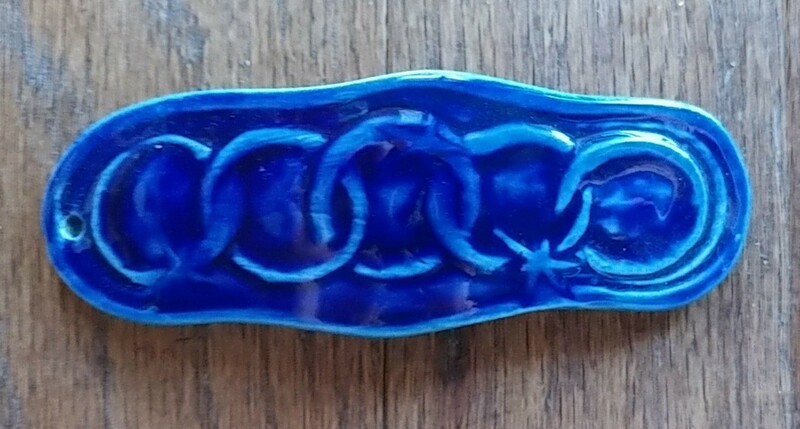 The chocolate clay shows through the high points of the glaze on the design. All pieces are 1902 through 1907-12. The fireplace tile in the background are also dark green Van Briggle tiles. Richard Sasicki writes that in 1955, the high gloss glaze colors of Honey Gold, Jet Black & Trout Lake Green were produced; while the Honey Gold became a darker brown color. 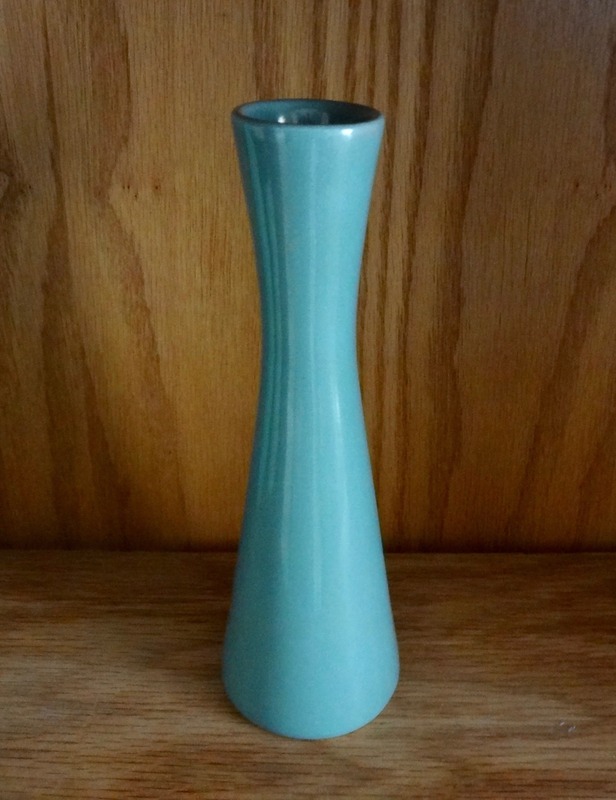 Other colors were produced at some point, which included the Turquoise and Light Blue. The high glaze Yellow and Green, when found, are often dated ’84 or ’85 for 1984 and 1985. 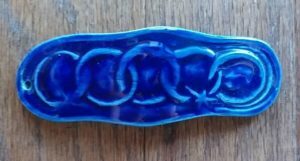 The high glaze Cobalt was introduced around that same period. 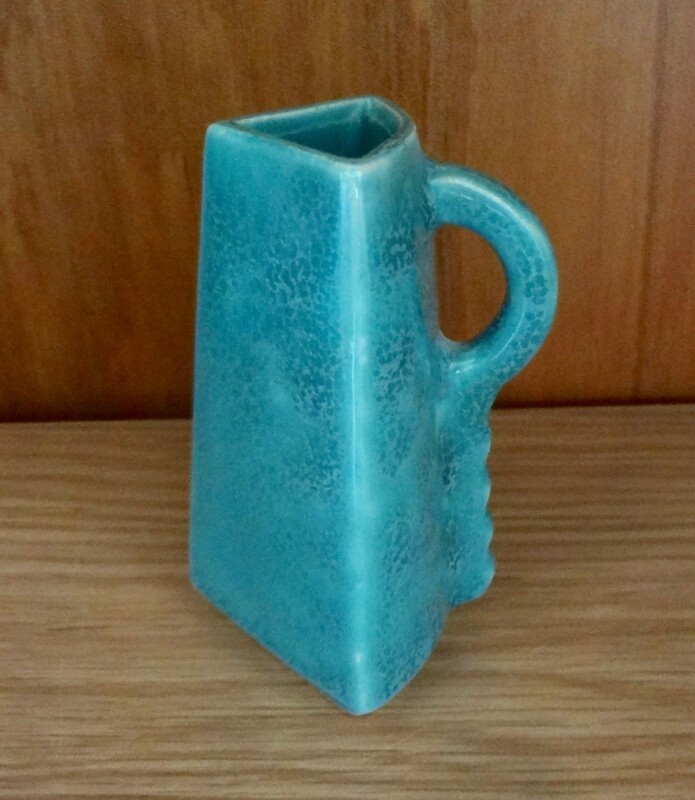 There was also a high glaze Celadon produced in the early 2000s. 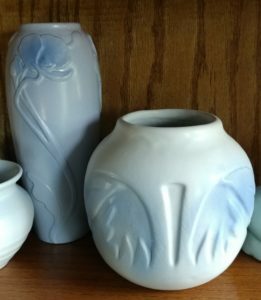 Moonglo is a soft white color introduced mid-century, during the Van Briggle Pottery ownership by Mr. Lewis. The name has been spelled two different ways in Van Briggle literature – Moonglo and also Moonglow; however, I believe Moonglo was used more frequently. 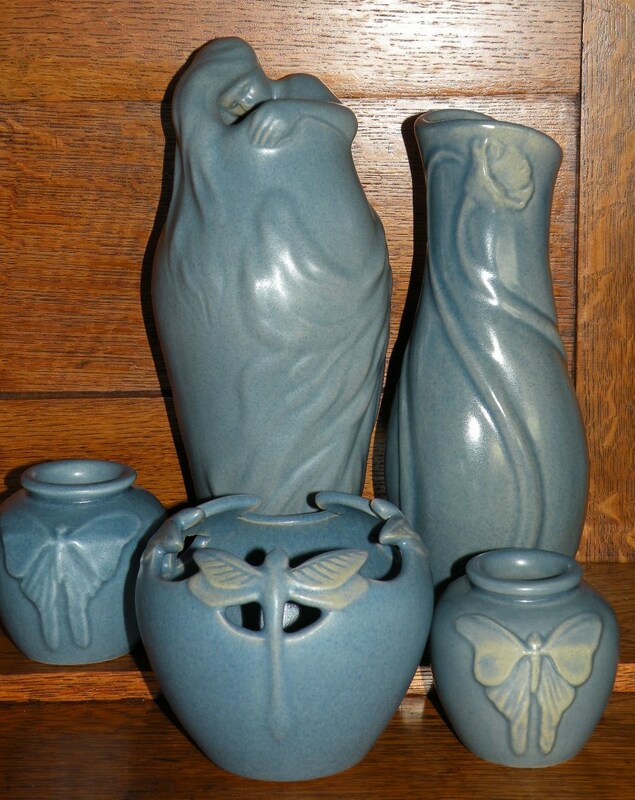 Many vases were produced in the Moonglo glaze, but decreased or discontinued a couple of decades later. The Moonglo was continued in use for the rabbits until the end of the pottery. 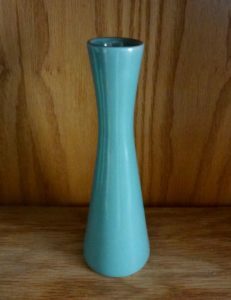 Moonglo is a soft white color introduced mid-century, during the Van Briggle Pottery ownership by Mr. Lewis. Later, a light over spray of blue was used; and the color called Moonglo Mist. Moonglo & Moonglo Mist were in use a fairly short time and then used only primarily for the rabbits. First advertised as “the browns and greens found in a mountain crag!” This has also been described as a honey brown with green over spray. Later, the name was inadvertently recorded as Mt Craig; and remained as such until the early 1920s literature was located! Produced during the 1920s until the Flood of 1935, when the formula was lost. 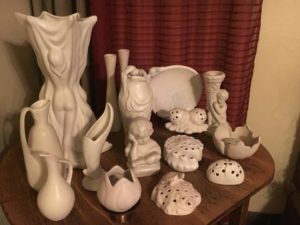 A potter who remembered the formula, made one batch of Mt. Crag Brown in the 1950s. Mulberry glaze was an early glaze, advertised in few brochures. Stated as almost blue-black in appearance. 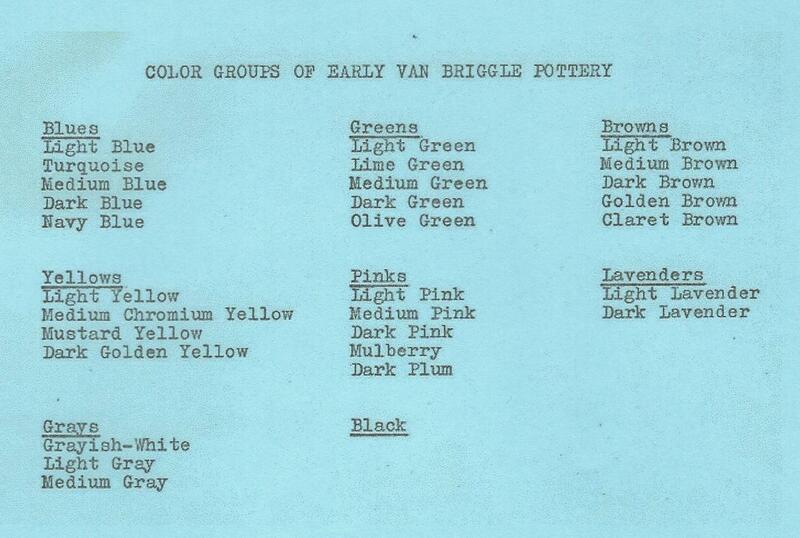 Persian Rose was advertised almost throughout the history of Van Briggle Pottery Co. The early years of Persian Rose were somewhat darker in coloration. 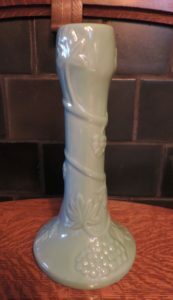 The glaze color was discontinued several times, as one component of the glaze was more expensive to produce than many other glazes. Persian Rose was reintroduced in the latter years, in a somewhat lighter version of the original. Artus developed and documented several shades of rose and pink prior to 1904. These pieces are all 1903-1914; with the exception of the gnome, who is thought to be in the teens. 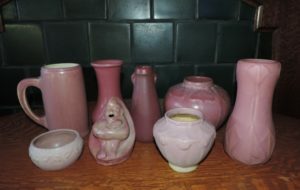 The middle piece in the back row is 1903, and a lighter color than the later Persian Rose, and in addition has a Gray Glaze over spray, not blue over spray as seen on Persian Rose. Three of the pieces have a Chartreuse Glaze over spray on top of the pink! Artus recorded several shades of lilac glaze prior to 1904. 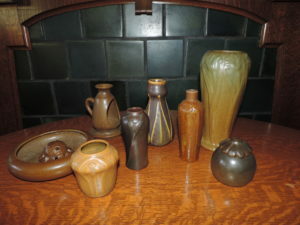 These pieces are dated 1906, 1903 and 1916; except for the tall vase, which Plum from 2011. 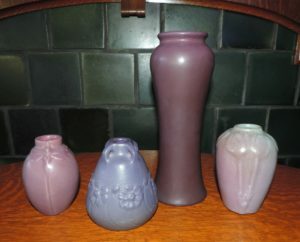 The 1916 vase on the right is a two-color glaze of lilac and grey. During Van Briggle Art Pottery’s relocation from the Roundhouse in the fall of 2008, a room was opened upstairs which had previously been sealed shut. When the door was pried open, the 5 ft. x 8 ft. room was found to contain a fine white powder approximately 3 feet deep. Craig Stevenson was consulted, and it was determined that this was the exhaust from the spray booth dust collection system. 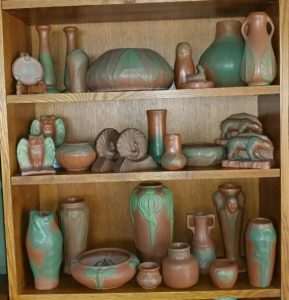 Under the assumption that this was all glaze material, the decision was made by Craig to collect this powder for possible future use by the company. In May 2009, after the pottery was in operation at 1024 S. Tejon St. location, Stevenson added water to a sample of the powder and dipped a V4 (for 2004)butterfly bowl, etched by D.R. and bisque fired in 2004. The result was a higher gloss than desired, and somewhat uneven and speckled; however, it was a beautiful denim blue in color. Stevenson granted Ned Tonge permission to continue working with the glaze. Gary Dhondt, master glazier at Van Briggle, was consulted and he taught Ned the current method of mixing and refining a small ten pound batch of the powder. Another butterfly bowl poured in red clay, etched by Candy Curtis and marked AO (for 2010) was used with this test batch. Not certain of the amount of glaze to use, Ned dipped the butterfly bowl into the glaze, drained it, and then turned it upside down and dipped it halfway again. 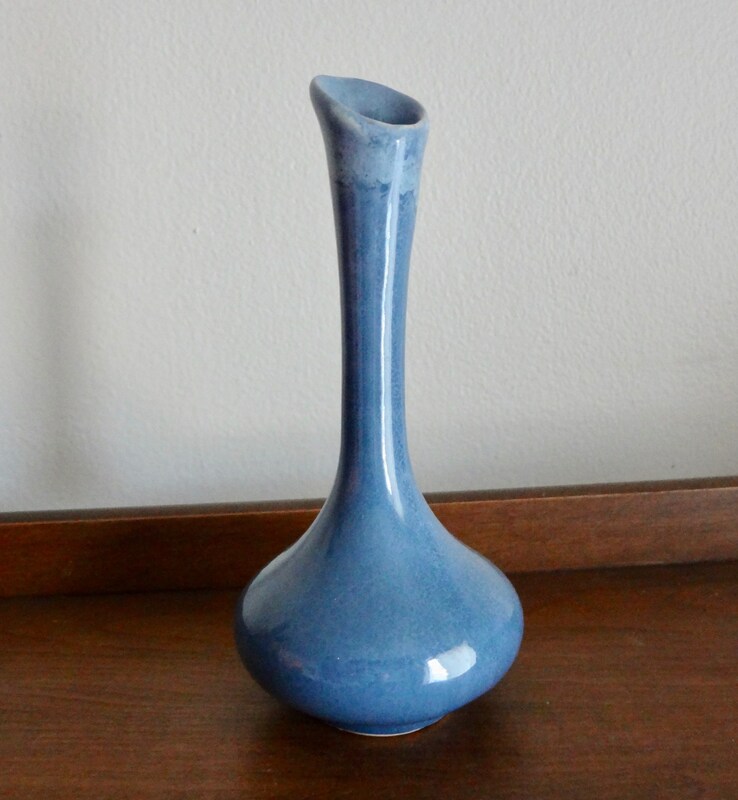 When this was fired, the double-thick part was a beautiful matte denim blue with a speckled finish. It was then that the staff knew they had something special! The name “Roundhouse Blue” was suggested by a long-time friend of the pottery; and the glaze was placed into limited production. 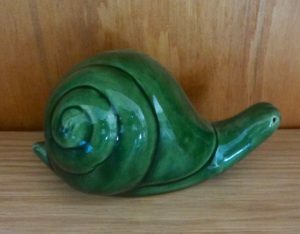 Ned, Candy & Gary have produced some dramatic effects with this glaze on butterfly bowl, dragonfly, rabbit and a few other molds. 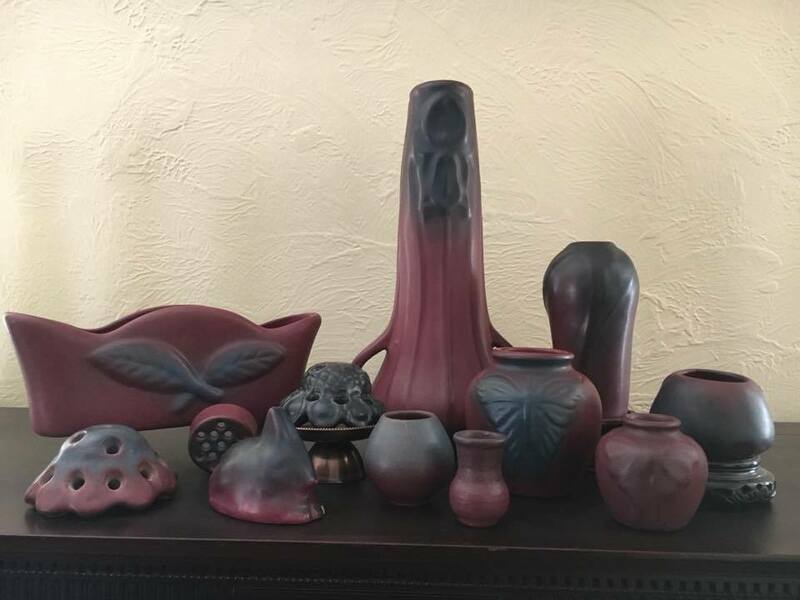 While the “exhaust spray powder” might be analyzed for reproduction; it was this 40+ year of accidental accumulation that yielded a most remarkable glaze effect! Information provided by Ned Tonge. Russet was in use from approximately 1978 to 1983. 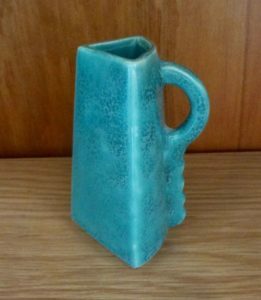 Robert Wyman Newton recalls the story that he designed the “monkey mug” shortly before 1978; and they were produced in Moonglo. He thought it inappropriate to have a white monkey; and encouraged them to develop a brown glaze. Jeff Stevenson was a young man working at the pottery at that time, and experimented with the glazes until he developed what is now known as Russet. Artus had 2 shades of white listed in his index prior to his death in 1904. The tall piece is 1906, with overall crazing. The pitcher in back row, on right, is almost an ivory. 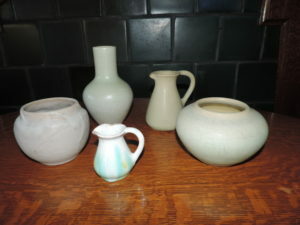 The small high-glaze creamer in the front has over sprays of blue and yellow. 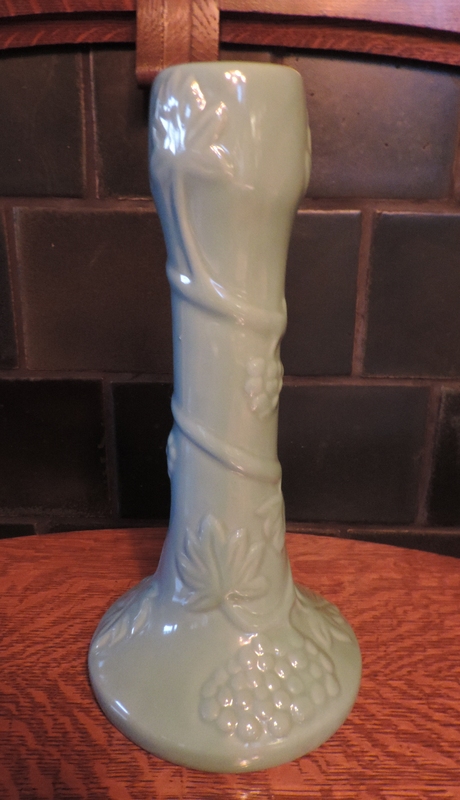 It has a chip, but is dated 1914 and fairly HTF in high glaze. Pieces date 1906 to 1914. 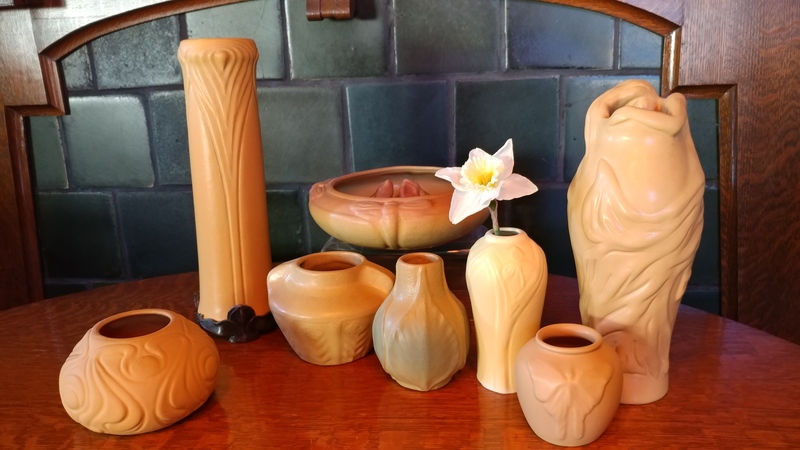 It has long been recorded that one of Artus VanBriggle’s favorite glazes was Mustard, a matte bright yellow, probably developed from appreciation of the Goldenrod flowers growing in the gardens adjacent to the first pottery at 617 N. Nevada Ave. Many shades of yellow are represented in the photo; including the tall, 1903 peacock feather design in a bronze base from the 1904 World’s Fair; the small Mustard, dead matte yellow in 1904; a 1914 yellow with green over spray; a dragonfly bowl & flower frog in strong yellow with red over spray; a 1913 milder yellow pot with 2 handles; a teens light yellow; and the two on the right,Lorelei & butterfly bowl in Goldenrod from the late 1970s-early 1980s. There are probably many more varieties of yellows and yellows with different color over spray glazes that exist. If you have photos to share; please email them to khonea77@aol.com for inclusion on this site to benefit all collectors.